Smoke and fire from grasses, leaves, paper and wood, leave sometimes unpredictable markings on the clay during the pit firing process. The effect is mottled and dappled, resembling what one might find on the forest floor. It is for this reason that I love to use this earthiest of techniques. 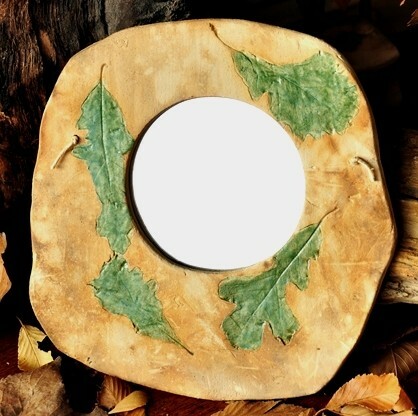 This mirror will suit a rustic taste, for someone who has a deep love for nature. Bring a little outdoors into any home living space. 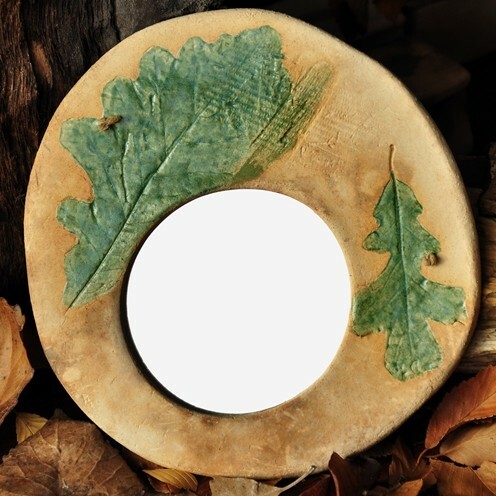 Oak leaves encircle the focal mirror. One of a Kind. It would look great in almost any area of your house. Hangs from a strong hemp string hanger on the back. 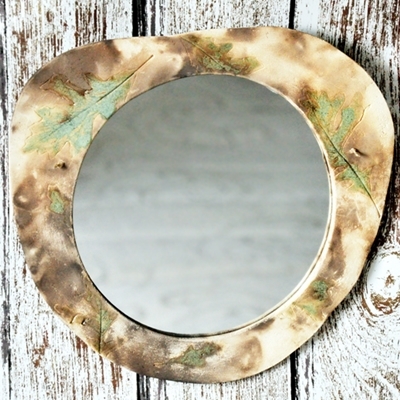 A round mirror is firmly glued onto the back. Measures 9.75″ w (23.5 cm) x 9.25″ h (23 cm). 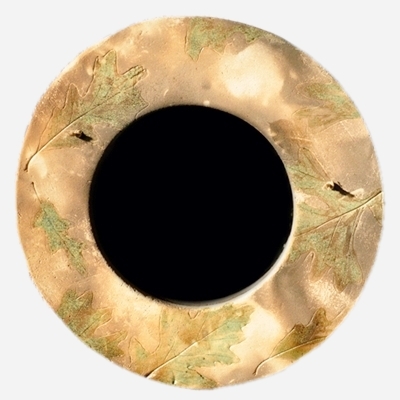 The mirror opening measures 7″ (17.5 cm) across. 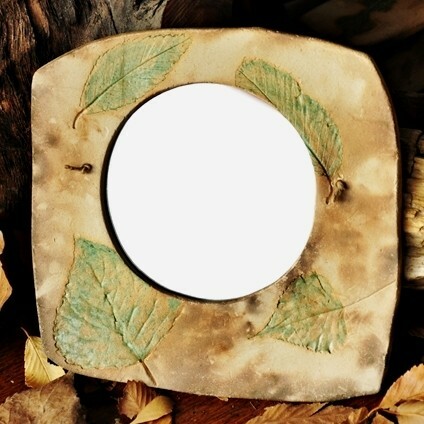 Measures approximately 7″ (17.25 cm) diameter. Measures Approximately 7″ (17.25 cm) x 5.25″ (13.5 cm). Measures 7″ w (17.8 cm) x 7 ” h (17.8 cm). The mirror opening measures 3-1/2″ (8.9 cm) across. Measures 7-1/8″w (18.4 cm) x 7-3/8″ h (19 cm). The mirror opening measures 3-1/2″ (8.9 cm) across. Measures 6.5″w (16.5 cm) x 6.25″ h (15.9 cm). The mirror opening measures 3-1/2″ (8.9 cm) across.